It was recently made aware of the discovery of some powerful and beautiful crystals from the Boreal forest of the Canadian Shield, far north of Lake Superior. The stones appear to be primarily composed of Amethyst, but they contain a wealth of other minerals as well. Their discoverer has named them Auralite. (The name Auralite-23 used above denotes that there are least seventeen different minerals in each specimen of Auralite.) As with the mineral known as Super-Seven, there is a unique synergy of energies in Auralite-23. Auralite-23 crystals are about 1.2 billion years old, having been formed during the Meso-proterozoic age, at the time when multicellular creatures first emerged and began to flourish. It has been suggested that meteoric impacts during this time brought rare metallic ores to the surface, where they eventually dissolved and were incorporated into the structure of the growing Amethyst crystal now called Auralite. The elements identified by assays using x-ray diffraction include the following 35, present in various samples. Auralite works most harmoniously with all forms of Azeztulite, as well as Rosophia. Its protective and purifying qualities are enhances by Guardianite. 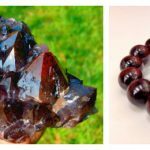 Using Auralite-23 in conjunction with Mystic Merlinite will enhance one’s potential to magically transform one self and to make positive magic in the mundane world. Master Shamanite aids both in purification and in deepening the meditative experience initiated by Auralite-23. 地質學家 Doug Suhwarzenberger 的官方正式研究計劃中，已經由科學證實 Auralite 23 為「世界上最古老的水晶寶石」，它形成的時間超過“1.2億年“， 每一個晶體中凝結著它這遠古以來的旅程，每一顆訴說著獨一無二的故事!